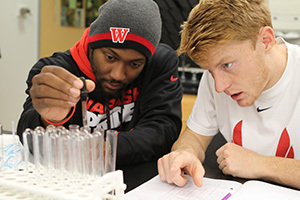 Wabash College ranked 50th nationally in the 2015 PayScale.com ROI report, a ranking released today of the best return on investment in higher education. Wabash graduates can expect to earn more than $597,000 more than a high school graduate over a 20-year period following degree completion. That figure placed Wabash in the top four percent nationally of the 1,223 schools ranked for providing the best monetary return through a combination of low cost of attendance and a high earnings potential for alumni. Based on this ranking, Wabash graduates earn more than $363,000 more over a 20-year period than the median college graduate, which breaks down to better than $18,000 annually. "Our young men don’t choose between science and art, or between academics and athletics, but instead combine elements of college life that many think are in opposition to each other," said Dr. Scott E. Feller, Dean of the College. "Similarly, the data from PayScale show that a student choosing Wabash does not have to decide between a liberal arts education and financial success." Wabash and Rose-Hulman were the only Indiana higher education institutions to appear in PayScale’s top-50 slots, outdistancing Purdue (53rd), Notre Dame (75th), Indiana (397th), and DePauw (677th). The Wabash placement also topped all other Great Lakes College Association members listed. Further, Wabash’s four-year full cost of attendance, reported as $175,900, was the third lowest of all private schools ranked in the top 100. Wabash was joined by National Liberal Arts Colleges Harvey Mudd and Lafayette in the top 50. The PayScale rankings are determined by the difference between the 20-year median pay for a bachelor’s degree recipient and the 24-year median pay for a high school graduate minus the cost of attendance.